I love coloring. I always have (just ask my mom). Now days I rarely use crayons, though. 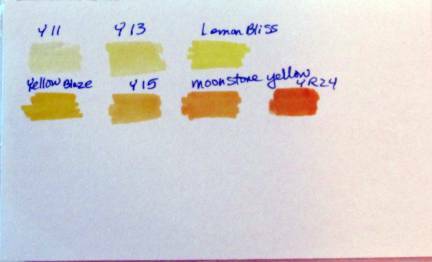 Instead, I use watercolor pencils, watercolor markers, distress inks with a water brush, or alcohol markers. 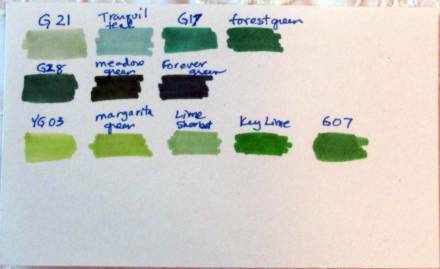 By far the most expensive of these options is alcohol markers, especially when you get into the 'Cadillac' of the medium, the Copic markers. 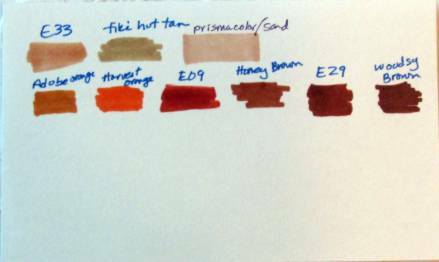 I started out with a basic set of Copics (36, I think) that I got on sale. When I wanted more options I found the Bic Mark-It set of 48 filled in nicely at a very reasonable price. Then I picked up a few Prismacolor pastels on clearance. 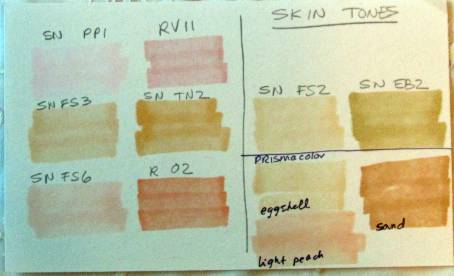 And, finally, I bought a small set of Spectrum Noir pens with flesh tones. All of these markers play nicely together. They can be blended just like they were all the same brand. The big difference for me is that they have different types of tips - some wide, some brush, some hard point, etc. You just have to make do with what you've got. I found it was impossible to tell what a color was from the color of the cap, the dot on the end, or the color name on the label. 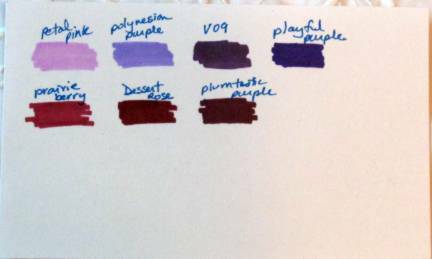 So I separated all my pens into color groups and started scribbling little color swatches. 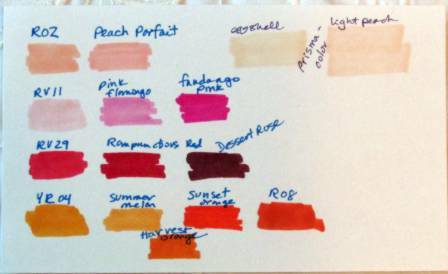 This allowed me to place the pens in gradation order for choosing blending ranges. I then made 3 x 5 cards into color swatch cards by coloring the pens in order and labeling with the color name or number. There is a card for each color family. 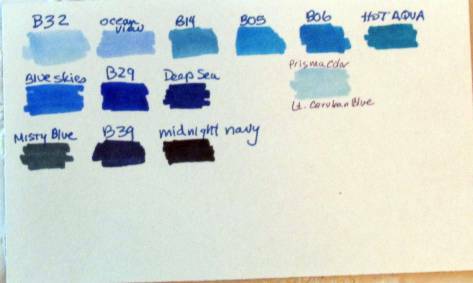 When I want to color something I take out the swatch cards, select three shades of a color range and use them to color highlights, mid-tones and shading. Some of the colors appear on more than one card when they cross between ranges. A reddish-orange might appear on the brown card, a dark red might be included on the purple card, etc. 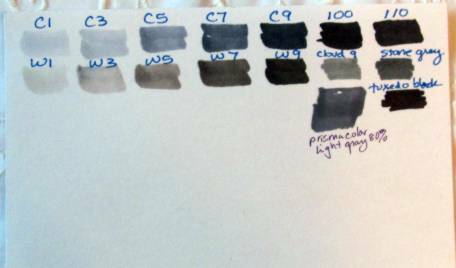 There is one card just for blacks and shades of gray, also. I got the Prismacolors last so their colors are out of order. I need to do the cards over with these moved over and intigrated into their range. I know that sometimes it is hard to decide what to put into a card you have created. I have collected greetings from all over and compiled them in categories to make it easier to find the appropriate one. I share my collection here so that you can make use of them as well. o Birthdays are good for you. Statistics show that the people who have the most of them live the longest. o So many candles, so little cake. o Birthdays are nature’s way of telling us to eat more cake. o A birthday is just the first day of another 365-day journey around the sun. Enjoy the trip! o Anyone can get old. All you have to do is live long enough. o Sing a song of birthdays, full of fun and cheer, and may you keep on having them, for many happy years. o Just to show you how sorry I am for forgetting your birthday… … next year I’ll forget mine! o We’ll be friends will we’re blue in the hair. o Like ice cream, our friendship has many flavors! And someday I hope to return all the favors! o A hug delights and warms and charms. That must be why God gave us arms! o Sending very special wishes you way for a bright an happy day! o Love is like a butterfly – it goes where it pleases and pleases where it goes. o When I married you it was for ‘better or worse’. When does the worse start? o Wherever you go, my love is there. o Love can make you crazy in the most beautiful way. o When you speak my heart lifts; when you smile my heart sings; when we kiss my heart melts. o Only God can make flowers and trees but He put me in charge of seeds and weeds. o Eastertide blessings on this holiest of days – as the light shines upon you give thanks and give praise. o A successful marriage requires falling in love many times – always with the same person. o God can heal a broken heart, but He has to have all the pieces. Give it all to Him. o Daughter – She’s a little bit of sunshine, she’s a smile to light your days; she will steal your heart and keep it warm with her endearing ways. She’s your precious little daughter with sweetness from above who fills your years with laughter and your lives with lots of love. o Here she is all peaches and cream, your sweet baby girl, long awaited dream. o One day the tears will cease to flow. Another bridge will be crossed; then you’ll recall those happy times with one whom you’ve loved and lost. o May God hold you in the palm of His hand and comfort you with His everlasting love. o Roses are red, violets are blue, I’m schizophrenic, and I am too. o When it gets dark enough, you can see the light. o If you don’t fall down now and again, it’s a sure sign you’re playing it safe. o Each life is like a unique quilt created by a patchwork of memories, stitched together by the threads of time and love. o Snowflakes fall when the angels have a pillow fight. o Every gray hair you have, I earned! o How did God know I wanted you for my mommy? o I never gave you any gray hairs, did I? 1) Keep blank 3x5 file cards with you when you're reading your scrapbooking and other craft magazines. When you see a technique you want to try, a product to buy, a website you want to visit - just jot it down - one item per card. File these by topic and use as inspiration when your muse is having an off day. I started doing this and now have consolidated lots of little torn scraps of paper into a useful file. I also clip out photos of neat card ideas and I tape these to cards for filing as well. I started a separate file of scrapbook layouts. Many I had saved from the internet, some copied from magazines, some are photocopied, some are hand drawn. All ended up on file cards with a notation of how many photos the spread holds. I filed them with dividers for the number of photos. 2) I read a tip that you should get one of those lucite cubes of 3x3 papers and use them to off-stamp the extra ink left on your rubber stamp after making your chosen impression. What a great idea! It leaves a shadow of the impression and you can use these decorated papers to jot a quick note to include with mailings. I already had a holder but the paper was all gone. I dug into my fancy scraps and cut small paper pieces down to 3x3 to put in the holder. Now I'm all ready to make some decorated note papers when I am stamping on a project. 3) When preparing to prick out a pattern for paper embroidery I tape two or three papers together. I can prick it out once and stitch up to three times. Usually by the end of three I am tired of the pattern but I rarely do anything exactly the same way twice. I usually prick out a dozen or so different patterns in multiples of each, with varying papers. When I am ready to stitch I can select the paper I want to work with and after completion I rotate to a different pattern.